Round three of the US PGA Championship at Baltusrol, New Jersey was called off at 23:00 BST on Saturday because of the threat of lightning. Of the 86 players to make the cut, only the top 10 had been unable to start when play was suspended at 19:15. Joint leaders Robert Streb and Jimmy Walker are nine under, two clear of Australia's world number one Jason Day and Argentina's Emiliano Grillo. Kevin Kisner is the clubhouse leader on five under after a five-under 65. Thirty-seven players had completed their third rounds before the klaxon sounded to suspend play. Round three is scheduled to resume on Sunday at 12:00 BST. Round four will follow from 13:40 with players teeing off in the same pairings as round three. 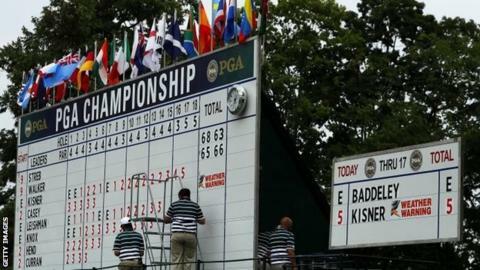 "The prospect of a second successive Monday finish to a US PGA Championship at Baltusrol looms ever larger. "The storms were no surprise, begging the question of why players were not sent out in threes off two tees in the morning. "As it is the championship is massively behind schedule and there is a worrying forecast for the coming days. "Some players are already speculating it could take until Tuesday to decide the final major of the year." Phil Mickelson, who carded a two-under 68 on Saturday to get to one under before the storm arrived, said he thinks the major record of 63 will be broken in the final two rounds this weekend. Streb birdied his last hole, after missing a birdie putt on the hole before, to card a seven-under 63 on Friday to move into a tie for the halfway lead. And Mickelson, who missed a putt for a 62 at The Open earlier in July, said: "There's a 61 or 62 out there because it's par 70, the greens are pristine - they're rolling beautifully - and they're soft. "There's just a lot of birdie holes." Mickelson won the US PGA when it was last held at Baltusrol in 2005. He added: "The rain has taken a lot of the fire and the speed out of the greens and it's also softened the fairways to where balls stay in the fairways. "You're going to hit a lot of six, seven and eight irons at the pin and have the ball just stop right by its divot is taking away the challenge of the greens." Ireland's Padraig Harrington, who won this tournament in 2008, had a bogey-free 65 to move up to four under. Russell Knox of Scotland rushed to tap in for par on the last to complete a three-under 67 and three under par total, seconds before the klaxon sounded to signify all play must stop. England's Justin Rose celebrated his 36th birthday with a four-under 66, that included three birdies in his last four holes, to move up to two under. And Italian Francesco Molinari had an incredible back nine, finishing with six successive birdies to post a two-under 68 for a one-under total. However, Wales' Bradley Dredge moved backwards, dropping five shots in his opening seven holes on his way to a 75 and five-over total. His compatriot Jamie Donaldson was lining up a four-foot par putt on the par-four first after playing his second and third shots from bunkers when play was suspended.